The Pandas basketball team is heading to the Canada West final four after a two-game sweep over the Thompson Rivers Wolfpack this past weekend. 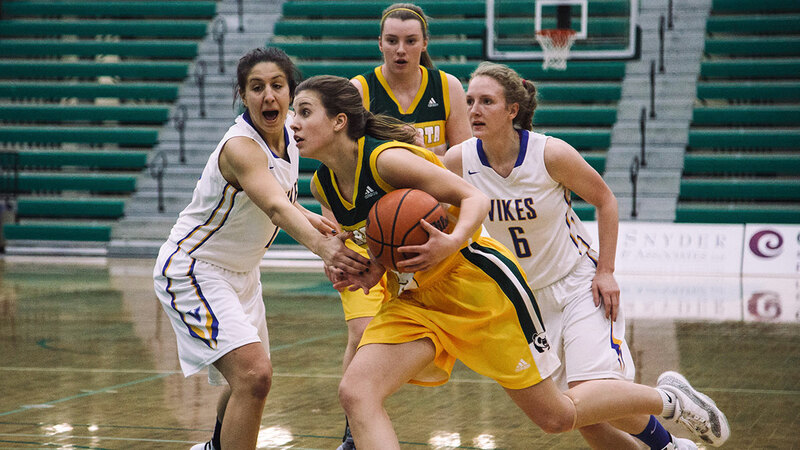 Alberta took care of business in convincing fashion in the first game on Thursday night, winning 77-48 on the back of a commanding second quarter performance that saw them outscore the visitors from B.C. 22-9. 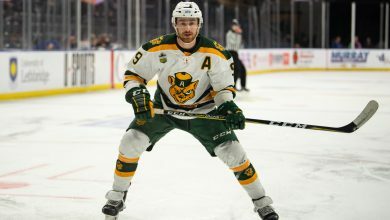 Even though the green and gold won convincingly, head coach Scott Edwards attributed their victory to a lack of execution on the Wolfpack’s side. The Wolfpack only shot 28.2 per cent in the first half as a team, and the Pandas were able to capitalize, building up a 20 point lead at half time, eventually cruising to the easy victory. Megan Wickstrom led the home side with 22 points, while Jessilyn Fairbanks chipped in 15 points and nine boards as well. If the Pandas thought the Wolfpack were going to roll over the next night, they were mistaken. The visitors hit the court on Friday as a much more motivated team, holding the Pandas to just seven points in the second quarter. The Wolfpack had a slim 46-45 lead heading into the fourth quarter, but the Pandas weren’t about to let the game slip away, as Jessilyn Fairbanks opened the quarter with five straight points for the Pandas, giving them a lead they wouldn’t surrender. The final score was 62-56 in the Pandas’ favour. Fairbanks led the Pandas with 21 points, while Maddie Rogers chipped in 18, along with six rebounds. Kassie Colonna led the Wolfpack with 20 points, while Taisya Worsfold put up 15 points and eight rebounds. Edwards said he was very pleased with his team’s execution in the fourth quarter. The Pandas now move on to the Canada West final four where they’ll hit the road to face the Saskatchewan Huskies, who boast the top record in the conference at 18-2. The Pandas and Huskies met twice during the regular season on Feb. 12 and 13, with the Pandas edging out a 78-77 victory and the Huskies responding immediately with a 73-61 win. 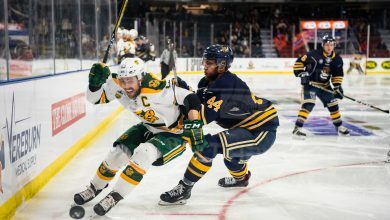 Edwards said that defeating Saskatchewan on the road will come down to his team’s ability to manage their emotions and execute a strong, team-oriented game. Edwards also highlighted the Pandas rebounding well and keeping their turnover numbers down as the keys to success against the Huskies high-powered offence, which averaged the most points-per-game in Canada West this past season with 79.5. The Pandas and Huskies will renew hostilities in Saskatoon this Friday. Tip off is scheduled for 7 p.m.